GOVERNOR’S ART SHOW – A fantastic art show featuring artists from throughout the state is held at the Loveland Art Museum each spring. Sponsors and art sales raise money for club projects in the community. People from throughout the state and beyond attend the show beginning with an opening night gala event. 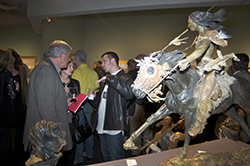 The show is open to the public and YOU can participate while helping the Rotary Foundation. DUCK RACE — Talk about fun, this event is a thriller! Large rubber ducks are decorated by people and businesses and many merit awards. Smaller ducks are “adopted” by individuals and families. 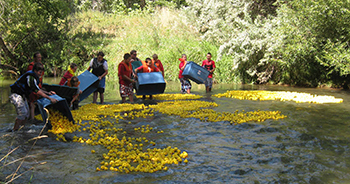 Each year about 7,000 little rubber duckies are poured into the Thompson River and float down to an end point where Rotarians pull them out and call off numbers on the bottom of the duck. The numbers coincide with the adopters. Top prize is $1,000 with many other prizes also awarded.